Muffins a great way to have a quick breakfast. We have been planting a garden for almost twenty years now. It is nice to be able to go to the garden to pick your own fresh produce. Some years are better than others for the amount of produce we get out of our garden. I wish that I could say that our garden produced an abundant amount of vegetables and fruits this summer. But in fact this is one of the most disappointing gardens that we have had in many years. But thank goodness I did get enough zucchini to make some of our old favorite recipes and a few new ones as well. My family absolutely adores zucchini breads and muffins. 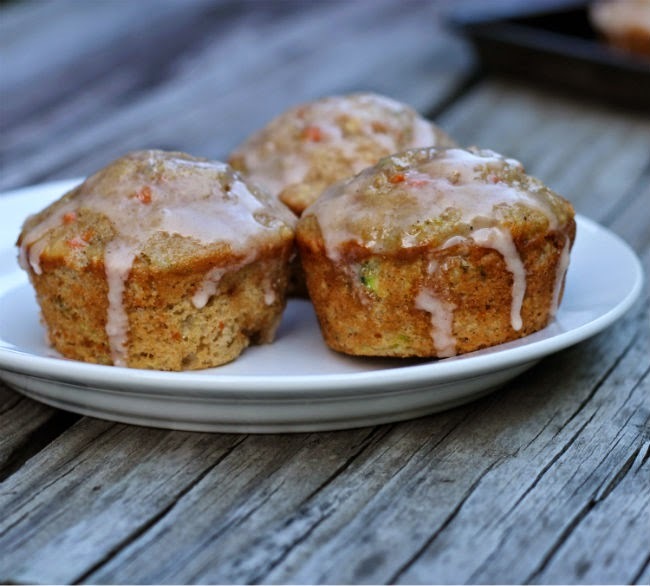 I love zucchini muffins too, but I enjoy adding carrots and apple once in a while to the mix. 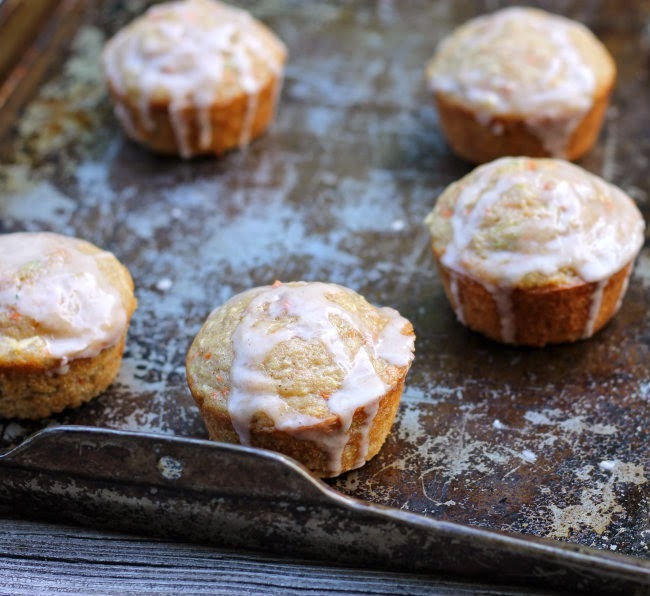 Like these zucchini, carrot, and apple muffins. I love seeing the flecks of green from the zucchini and the orange flecks from the carrots. It is amazing how moist these muffins turned out. I am sure that the apples and zucchini help with this. I topped this with a little cinnamon glaze for an additional flavor. These are perfect for a quick breakfast. 1 Heat oven to 375 degrees F.
2. Lightly grease muffin tins. 3. In a large bowl add flour, baking powder, baking soda, cinnamon, salt, and granulated sugar, mix well. 4. In another bowl whisk egg and add the buttermilk, and oil, mix well. To this mixture add the shredded zucchini, carrots, and apples, mix well. 5. Add the wet ingredients to the flour mix and fold until just blended. 6. Fill each muffin tin 2/3 full and bake in the preheated oven for 13 to 15 minutes or until golden brown. 7. While the muffins are baking mix the powder sugar, cinnamon, salt, and milk together. Beat until smooth. If you need you can add milk or powder sugar to get the right consistency. 8. Remove muffins from the oven and cool on cooling racks for about 5 minutes. Run a knife around the edge of the muffin and remove from tins. 9. Cool until completely cooled. Drizzle with icing. Love mish-mosh muffins, like these. Yum. My mother-in-law gardens and as far as I can tell, how productive it is is totally hit or miss. You never know! At least you got to make these muffins! They sound so good and pretty healthy. A great way to start the day! Yes, what a beautiful way to start the day…I absolutely like the idea of apples in these muffins…yum! 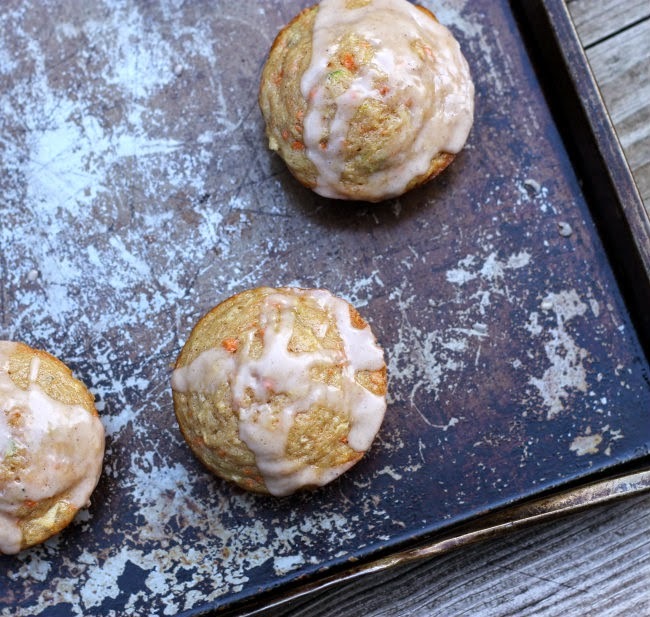 Oooh, carrots, apples and zucchini all in one muffin? I just know I’d love these! Oh they look simply wonderful! These muffins look delish. Incredibly moist, but I think they would be consumed all too quickly in my house! !